(continued from page 1) works with several miles of mains, and a large electric light plant. Perry is the county seat of one of the largest and best counties in Oklahoma. The United States Land Office is located here, practically making this the headquarters for all of the vast region comprising the eastern district of the Cherokee Outlet. This business is of much importance to the city. This is also the home of the associate justice for this district, and the United States as well as the Territorial court, is held at this place, making it an important legal and political center. There is already a splendid system of graded schools under competent management, which are making fine progress, with an enrollment of 620 pupils. Thirteen teachers are employed, including the superintendent. 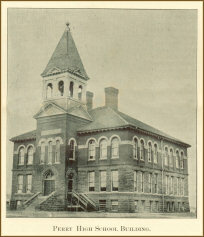 Perry's school buildings have been erected at a cost of $25,000. The Perry Academy, under the control of the Congregational church, is a promising institution of learning. There is nothing that adds more to a town as a desirable place in which to live, than good schools and colleges; they add a refining, intellectual influence to society which is very wholesome. The different church orginizations (sic) are well represented in Perry. Following are the different churches which have regular organizations and pastors: Congregational, Christian, Methodist Episcopal, M. E., South, Presbyterian, Episcopal, Baptist, Catholic. The buildings are creditable to the energies of the people who erected them. All have their usual auxiliary societies and young peoples' meetings. The Christian society in this town makes it a suitable home for any worker in the Faith. The usual civic and fraternal orders have flourishing lodges organized where they work together in the spirit of their orders. Those represented are the A. F. and A. M., Blue Lodge, Royal Chapter, I. 0. 0. F. Encampment and Rebecca, K. of P., G. A. R., Sons of Veterans, Womans' Relief Corps, K. of L,. Eastern Star, A. 0. U. W., Red Men, and Woodman. Socially Perry is a pleasant place of residence. The people are naturally of a social turn and endeavor to make all happy with whom they come in contact. There are no castes, and decent respectibility recommends one to public favor. They have their clubs, their socials and pastimes. All of the culture and purity of the home pervades every avenue of society and its influences are of an ennobling character. This is but a fair type of the modern western town, though there has been no "boom" in its growth; simply at a steady even rate it has kept pace with its surroundings and grown up with the country, though rather inclined to conservatism. Its business men and citizenship are industrious. Many of them have come from over-boomed towns and have profited by their experience. The labor and industry required in developing a new country creates the wealth, and the people here are not merely engaged in bartering and dickering that takes capital from the savings of one man and adds it to that of another. There are opportunities here for men to engage in business or invest capital profitably. Those interested will do well to visit the city or correspond with some of the business men whose names appear in this paper. This gentleman was recently appointed Receiver of Public Money of the Land Office at this place. and he is quite favorably impressed with his new home. Mr. Powers comes from Pennsylvania where he was born and has made his home all his life. He was educated in the common schools of Rochester and was at Washington College two sessions. At the age of eighteen he took up civil engineering on the surveys of the Philadelphia & Erie Railroad and has made it his life's profession. 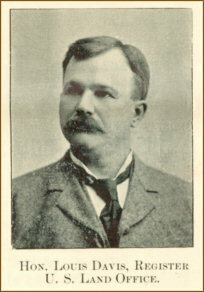 He has been principally engaged in railroad work, and, with the exception of having been county surveyor of Beaver county and upwards of three years spent in surveying lands in allotment for the Indians in the Quapaw Agency, I. T., and the Warm Spring Agency, Oregon, this is the first public office which Mr. Powers has occupied. He secured his present position through Senator Quay, whom he has known since boyhood. Mr. Powers will make a good official and our people will no doubt be pleased with his administration of the office. 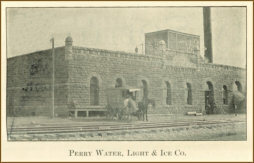 Perry Water, Light & Ice Co.
A neat, well kept business house adds much to the appearance of a town and impresses the stranger that the proprietor is up to the times. 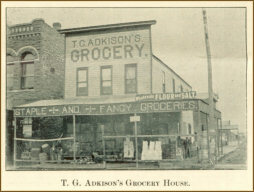 The grocery establishment of T. G. Adkison, which is shown in a photograph upon this page, is the neatest and cleanest grocery house in Perry and resembles the houses in the large cities more than in a town the size of Perry. Mr. Adkison is a thorough groceryman and has enjoyed a successful business career in Perry. He began business on a side street; later he purchased the splendid location where he is now - northeast corner of square. Besides taking the lead in a retail way, he has launched out into the wholesale business and does quite a good deal of jobbing to the merchants in the surrounding towns. He makes a specialty of fine, fancy groceries and his stock comprises the best that money will buy. By handling this grade of goods, he has secured the best class of trade and he caters particularly to their wants. This gentleman has been the Register of the Land Office at this place for the past four years. He bears the highest reputation for honesty and integrity and has probably fulfilled the duties, of his office as well as any man could have in fairness to all. Judge Davis came here from Georgia. He was for a number of years a mender of the Georgia state senate and was appointed to this position at the instance of Hon. 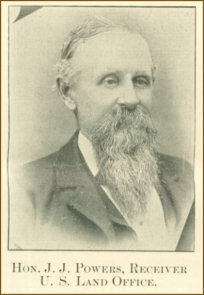 Hoke Smith, Mr. Cleveland's secretary of the Interior.